Minneapolis officials and community leaders on Monday called on protesters to end their "occupation" of the street outside the 4th Precinct police station, saying it had become a public safety hazard. Protest leaders, however, responded with a firm "no," setting the stage for a potential clash between police and those outside the precinct building who've been demonstrating since the Nov. 15 police shooting of Jamar Clark. 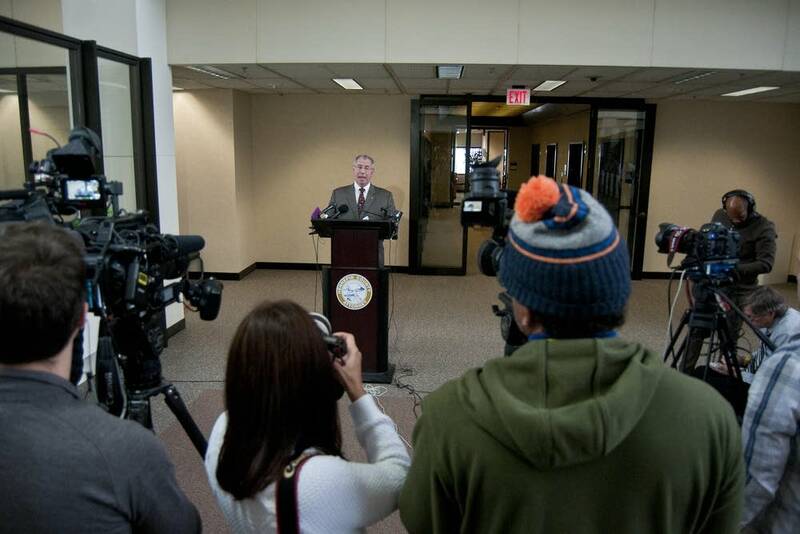 The standoff came on the same day the Hennepin County Attorney's Office unveiled charges tied to the Nov. 23 confrontation near the precinct station that left five wounded. Allen L. Scarsella, 23, of Lakeville, was charged on six felony riot and assault counts. Joseph M. Backman, 27, of Eagan, Daniel T. Macey, 26, of Pine City, Minn., and Nathan W. Gustavsson, 21, of Hermantown, Minn., were also charged. According to the charges, all the men admit to being present at the protest, and Scarsella admitted to shooting and wounding five people. After the shooting, Scarsella allegedly contacted a friend who is a Mankato police officer and confessed his role in the shooting. Prosecutors say that friends described Scarsella as someone who had negative experiences and opinions of African-Americans. Hennepin County Attorney Mike Freeman vowed to "prosecute them to the full extent of the law" and said new charges might be possible if additional evidence comes to light. He added that federal charges are another possibility, and that it was clear to him the men held views that some would call racist or inspired by hate. Some protesters had wanted the men charged with attempted murder. They objected to the charges brought by Freeman, who told reporters that riot and assault felonies were as far as he could go given the evidence. Minneapolis NAACP head Nekima Levy-Pounds said protesters want a special prosecutor assigned to the protest shootings. "We cannot trust what's happening at the Hennepin County Attorney's Office in terms of holding people accountable," she said. She also repeated calls for federal officials to take control of the Minneapolis police. Protests began almost immediately after Jamar Clark was shot in the head by a Minneapolis police officer. Police say Clark had been interfering with paramedics who had been called to a birthday party to aid Clark's girlfriend. According to a Minnesota Bureau of Criminal Apprehension statement, the responding Minneapolis police officers believed that the woman was an assault victim and that Clark was a suspect. The head of the Minneapolis police union said Clark was reaching for an officer's gun when he was killed. Witnesses and protesters, however, say Clark was on the ground and in handcuffs when he was shot. The BCA probe continues and the U.S. Justice Department is investigating for possible federal civil rights violations. While there have been flashpoints between protesters and officers outside the 4th Precinct the past two weeks, the scene was largely peaceful during the long Thanksgiving holiday weekend. On Monday, however, Minneapolis Mayor Betsy Hodges and other community leaders declared that the protest encampment had become a public safety hazard and needed to end. 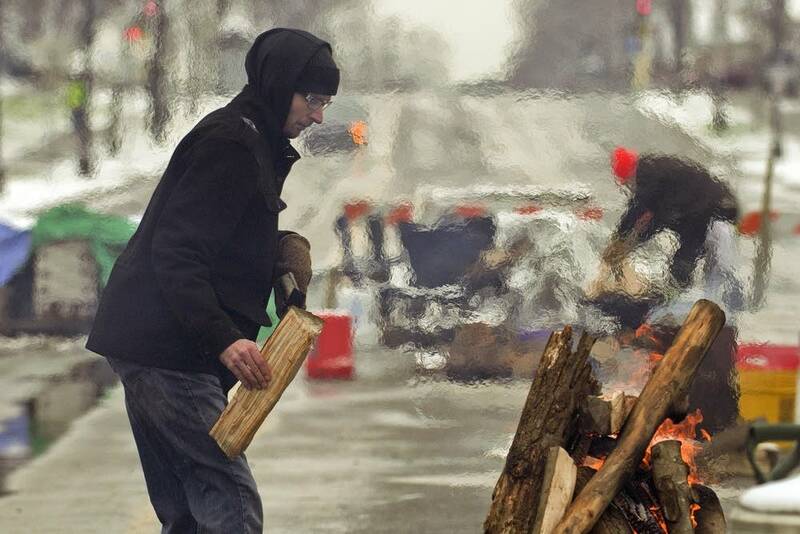 "The occupation of the 4th Precinct is unsafe for everyone," Hodges said, noting that campfires burned by protesters were fouling the air and that barricades set up on Plymouth Avenue were impeding emergency vehicles and snowplows. "There have been false medical calls, creating chaos and dismaying everyone," Hodges said, adding that there have been "near-daily threats to burn the precinct, kill our officers and hurt people." Hodges was joined by U.S. Rep. Keith Ellison, D-Minn., Minneapolis Urban League Interim President Steven Belton and some north Minneapolis neighbors in calling for the encampment outside the precinct to end. "We're not saying end the protests" over Jamar Clark's shooting, Belton said. "We're just not going to hold the community hostage any longer. We're asking that you respect the community and the people you have said you are here to serve." Ellison said north Minneapolis residents are calling his office, saying emergency vehicles can't get through and that smoke from campfires is affecting a community that already suffers bad air quality. The Minneapolis public housing authority said campfire smoke was affecting air quality in a nearby 84-unit senior high rise. "The unintended effect is that north siders can't use their main thoroughfare, Plymouth Avenue, [and] domestic terrorists are coming to the protests to start trouble," Ellison said. He noted that Clark's family has called for the protests outside the precinct to end. Protest leaders were unmoved. They said the police were preparing to forcibly remove them from the street. Asked what protesters will do if that happens, Levy-Pounds said, "The people have declared that they are not willing to leave the 4th Precinct occupation." Levy-Pounds and others continue to demand that authorities immediately release video collected of the Jamar Clark shooting. Officials, however, say they will not release the video until their investigation is complete. 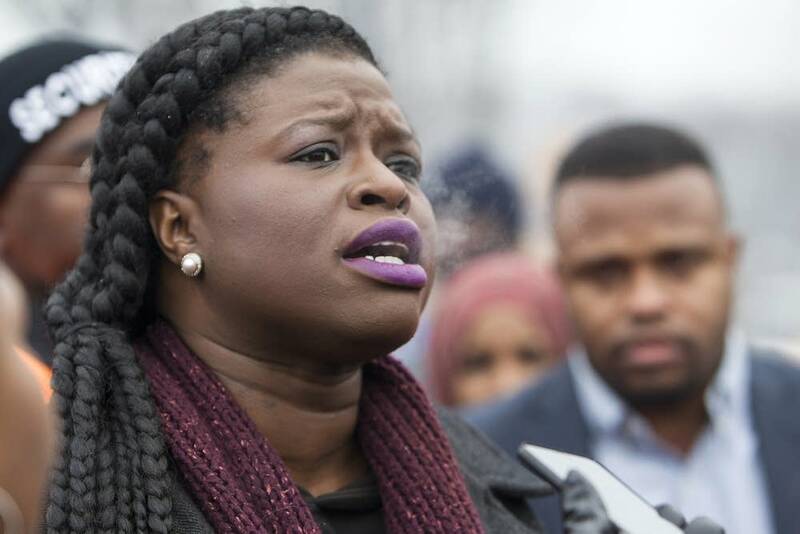 Levy-Pounds had harsh words in the afternoon for Hodges and for Ellison and other black leaders who stood with her to call for an end to the 4th Precinct street protest, at one point describing them as the "black misleadership." 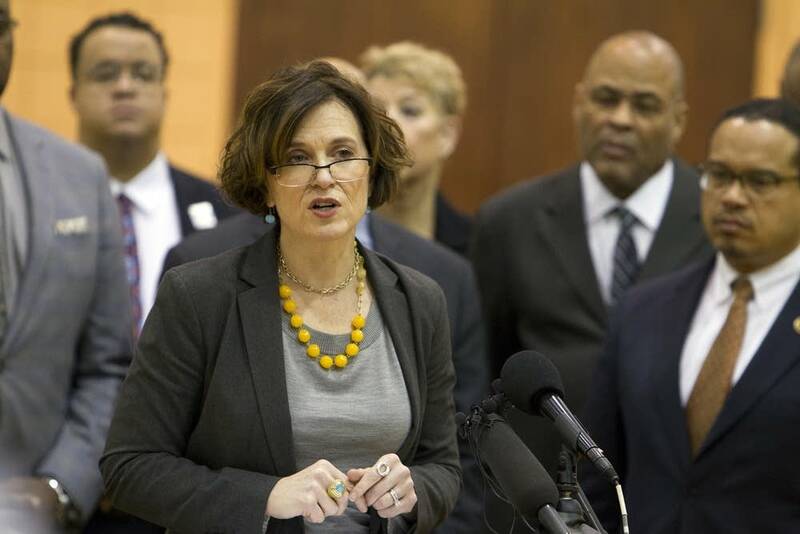 "Everybody that stood with Mayor Hodges is not part of the solution, they're part of the problem," she called to protesters through a bullhorn, adding, "That's not the Minneapolis NAACP saying that. That's Nekima Levy-Pounds saying that as an individual, because I accept whatever consequences come with me speaking the truth because the truth shall set us free."